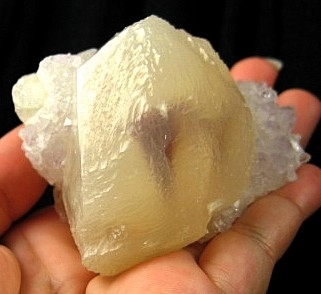 This is a gorgeous large calcite crystal. The exterior as a satin texture with undulations in the surface that shimmer in the light. 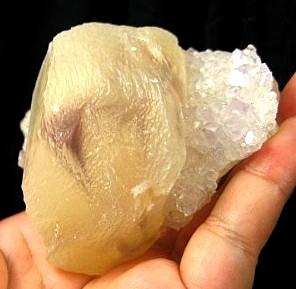 You could almost consider the calcite to be terminated, as some faces are present. 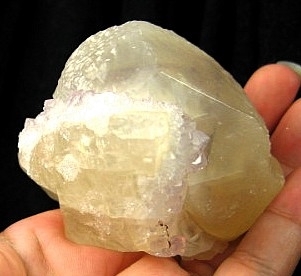 The color is lightly golden calcite containing unique phantoms of purple and red. 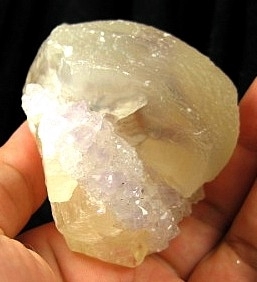 Surrounding the calcite are dozens of amethyst crystals in pale lavender. Their faces glitter in the light, dancing with vibrant energies. 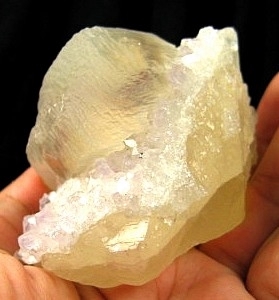 The calcite and amethyst crystals are in excellent condition. Its energy opens the crown chakra, filtering the energy down to your root. It really clears the cobwebs from the mind! It helps you think more clearly and assists with problem solving. It helps you take seemingly unrelated events and find the threads that tie them together. It works through your blockages, allowing energy to flow on all levels. It helps to open your crown and third eye to use both your knowledge and intuition on practical matters. This gorgeous formation is from Uruguay. 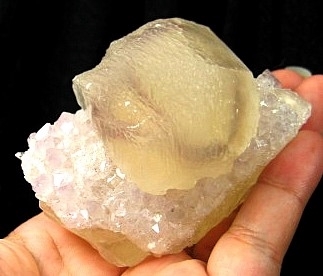 Calcite is a family of calcium carbonates that occurs in a wide range of colors and formations. Most commonly it occurs in opaque masses but it can occur in a wide array of crystalline habits. 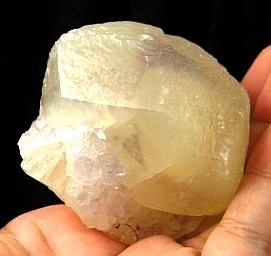 Calcite is a soft mineral, with a Mohs hardness of 3. Because of its relative softness it is often carved or polished. Rough pieces are usually given an acid bath which softens the rough edges and give the stones a silky sheen. 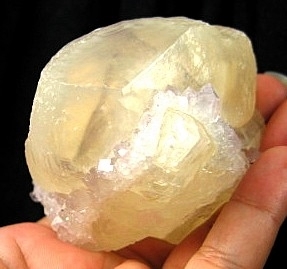 Calcite has an amazing energy that refreshes and revitalizes, yet is still gentle. They help to remove blockages and break up old patterns. 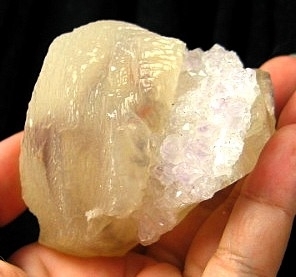 The wide range of colors ensures there is a calcite for every chakra. These strong yet gentle healers are easy to work with no matter your age, and even vibrate well with our feathered and furry friends. 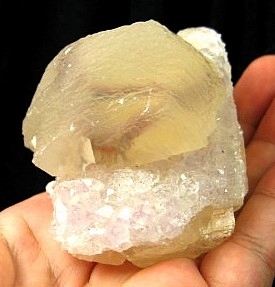 Calcite is a great all round healer and can be found in a wide array of colors. 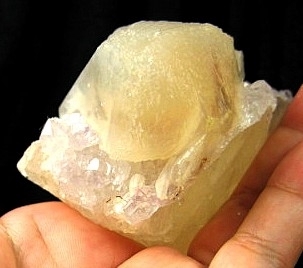 Energize your body’s natural electrical system using this crystal in your hands, at your feet or chakra point. You may use spheres, eggs and wands for massage. Placing your feet on a large piece will energize the whole body out of sight. 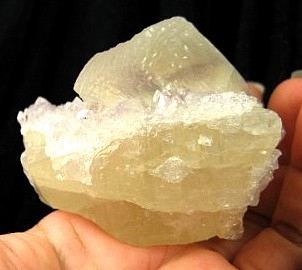 Calcite comes in many colors, forms and locations. It is a crystal of fantastic variety and each one has its own benefits. 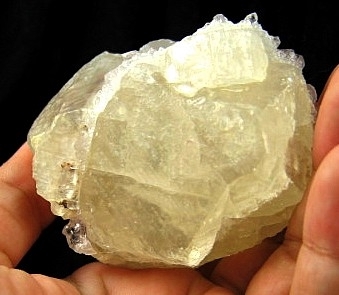 Due to its electrical nature, Calcite makes for a potent elixir. 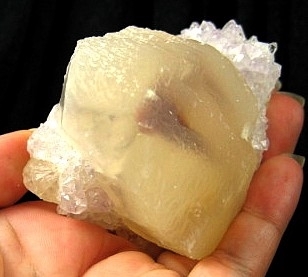 Calcite is a crystal to help one get out of ruts, or break through blockages on just about any level. 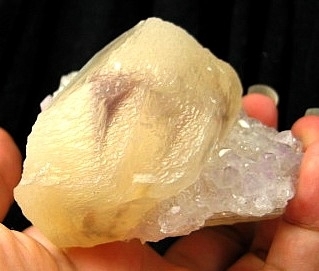 It is also a crystal for ascension.